Looking for a ham glaze that’s the sticky balance between sweet and spices like cloves? 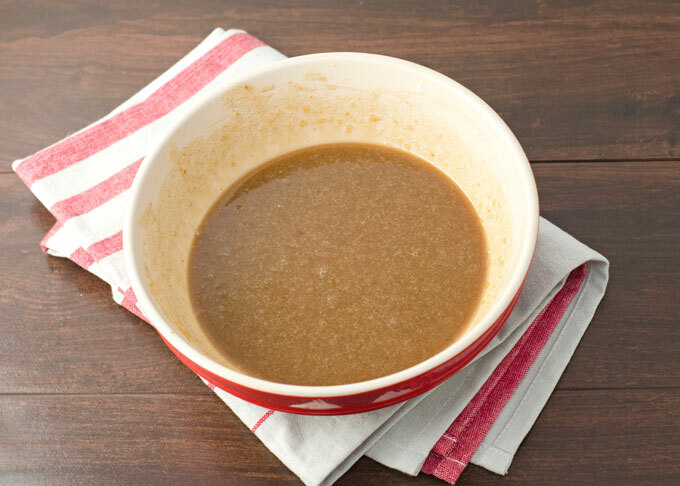 If so, you’ll want to give our brown sugar ham glaze recipe a try! A good ham is usually seen on Easter, sometimes Thanksgiving, and Christmas. 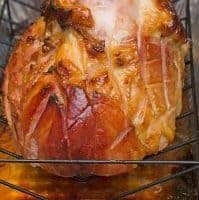 I personally love having a big ham several times a year because they are affordable, easy to make, and you can do a ton with the leftovers. 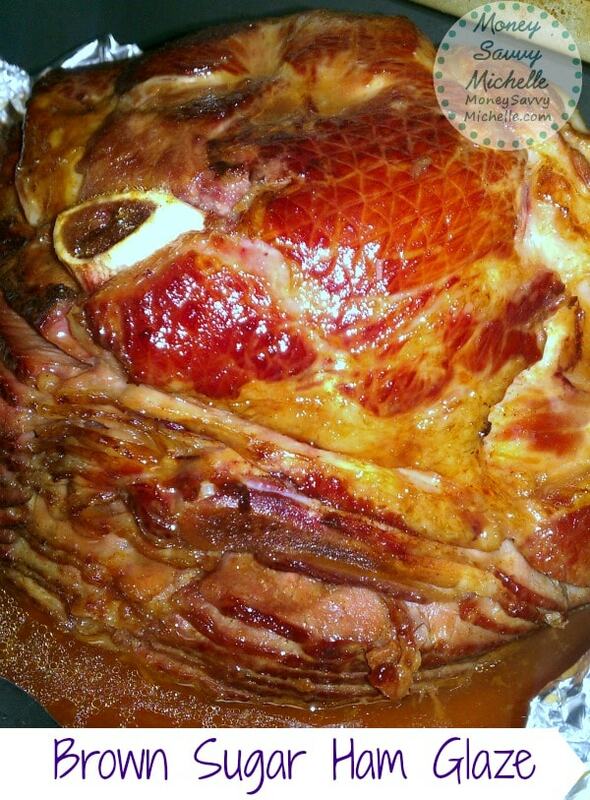 I originally made this ham with brown sugar glaze back during Easter. Pretty much every year we’ll have a nice spiral ham dinner with colcannon and homemade yeast rolls. But, I think ham is awesome enough to have year round instead of just at Easter and the holidays. It’s even wonderful grilled using this Brown Sugar Ham Glaze recipe! The skin on this glazed ham shank was so good we were practically fighting over it! I love being able to get spiral hams and ham shanks at such great prices around Easter and the holidays. I will often get an extra one or 2 to stick in the freezer as they are certainly cheaper than the ready-made ones you can buy at places like HoneyBaked Hams, as tasty as they may be. I have to say, though, with a good ham glaze a home-cooked ham can be just as good, if not better! I know many like to go to the trouble of all the cloves or pineapple with cherries bells and whistles, which certainly look beautiful. I just like a simple glaze that’s slightly sweet and spiced. Even though many hams now come with a glaze packet, I like making my own. Another benefit I have found to ham glazes is that they can really help for those times we inevitably overcook at least part of the ham. Just store any dry parts wrapped up in the leftover glaze, then, when ready to reheat, transfer the ham with glaze into a baking dish, adding just a touch of water if it’s really thick, cover with foil, and bake. Scoring an unsliced ham will help the glaze flavor the meat and the skin to crisp up a bit. 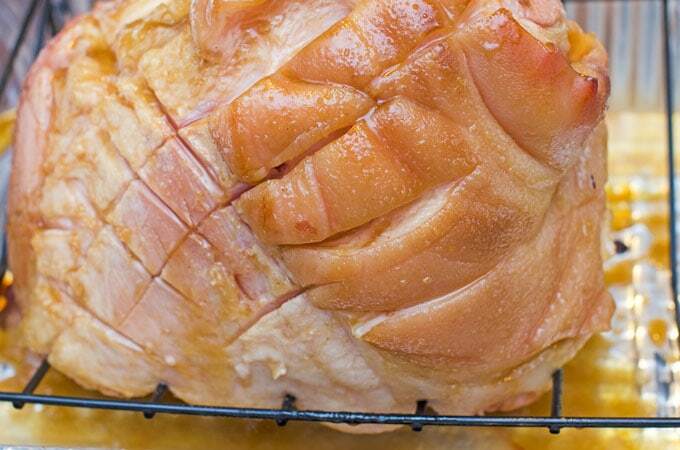 This is our favorite brown sugar ham glaze recipe. It’s sticky and sweet from the brown sugar and honey while the vinegar provides a bit of tang and the flavor notes end with a slight spice. While you can also cover the ham with the glaze and whole cloves or pineapples and cherries, I think the sheen from the glaze itself makes the ham look gorgeous. 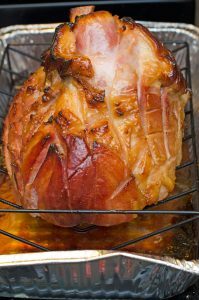 This ham glaze recipe would be great on all sorts of ham types, but we usually get a spiral cut and make sure to get the glaze down in between the slices of the ham. We’ve also recently really enjoyed getting a smoked shank cut, but they aren’t usually sliced, so I suggest at least scoring it a bit so the glaze can seep down and really help flavor the meat. If your shank has a nice portion of skin, the glaze will also help it turn into pig candy that’s even better than using bacon. It was so good Mr. Savvy and I were practically fighting over it. I’ve also made up the brown sugar ham glaze and thickened it slightly over low heat when cooking ham steaks for dinner. Here’s how to put it together. As a heads up, this section contains affiliate links, which means if you purchase a product after clicking on a link below we may earn a commission fee. All products linked below have been tried and true tested in our kitchen and are items we use regularly. We thank you for your support! A whisk as this recipe takes some whisking to come together properly. I like this one because you can also use it in non-stick pans. A roasting pan with rack. As you can see from the pictures I do often use a disposable pan because this glaze can get super sticky and I hate doing dishes. You can use a reusable roasting pan and line it with some foil for easier cleanup, too. I like using a rack either way so the ham isn’t boiling in juices the whole time. A basting or pastry brush. This glaze works best if you baste the ham at least a couple times. A good knife for slicing. Even if you use a spiral ham, you’ll still need to do some slicing. Yes, this knife is inexpensive but does hold up very well. 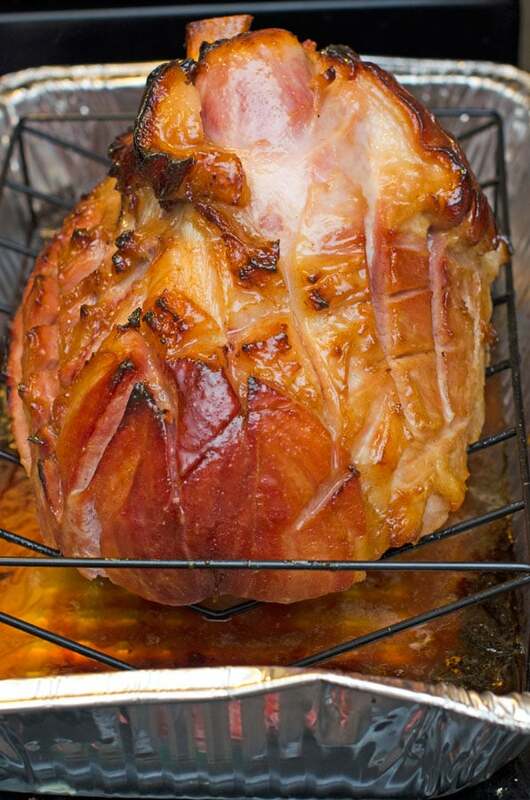 This brown sugar ham glaze will turn any ham from drab to fab! Whisk together the brown sugar, flour, mustard, spices, vinegar, and honey until thoroughly combined. If the glaze is too thick to brush on, thin it out with a tablespoon of water at a time until it is the desired consistency. If you thin it out too much, you can pour it into a pot over medium to medium-high heat and reduce until it thickens, stirring often, or add a bit more honey. *Spread or brush the glaze over the ham before putting it into the oven, being sure to get the glaze in between the slices or scores. I like to put the glaze on the ham, cover the pan with the ham in it loosely in foil so it won't burn, and then take the foil off the last 20 minutes or so, so the glaze can get nicely caramelized, basting with more glaze as needed. *See notes section below on cooking your ham. I am often asked how long to cook the ham with this recipe, but exact cooking time will depend on the type of ham and how large it is. 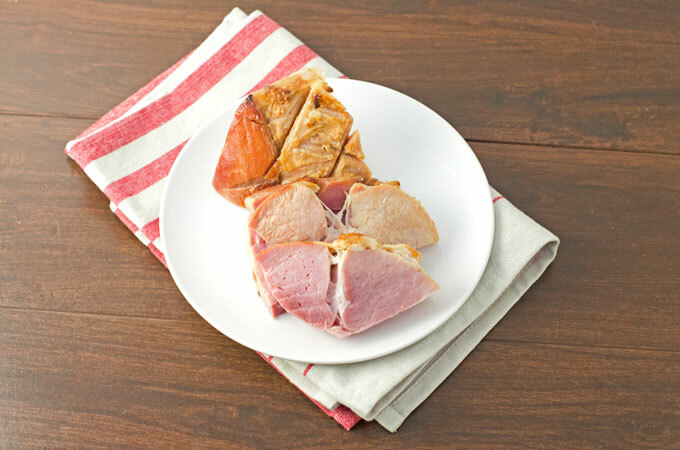 The packaging for your ham will usually tell you how long your ham needs to cook, but for pre-cooked hams, it is usually 325F for 15 - 20 minutes per pound. I have never cooked a ham that wasn't pre-cooked so I have no advice there. If I'm cooking a ham that will take 3 hours or more, I generally let the ham start baking for about an hour without the glaze, but covered in foil. After the first hour, I'll glaze the ham and cover in foil again, then baste with more glaze every 30 minutes. The last 20 - 30 minutes of baking time, I'll take off the foil so the glaze can caramelize a bit. If your ham will take less than 3 hours, you can put the glaze on at the beginning, but still make sure to cover the ham in foil as this glaze will start burning if exposed to direct heat more than 45 minutes - 1 hour. Covering in foil also makes for a moist ham. Don’t forget to save your ham bone for some delicious split pea soup and check out these 15 ways to use leftover ham. Have you done this recipe with apple cider vinegar instead of white? I’m assuming it would just add to the sweet fruity flavor? Thanks for stopping by. I have not made this recipe with apple cider vinegar but I think it would be fine to use. Let me know how it turns out if you give it a try! You are amazing! Thank you ever so much for sharing this recipe. I used it for my Thanksgiving ham today and it was a total success! My mom couldn’t stop picking up pieces of ham every time she’d walk by the stove. My family raved about it! Even my cat was wowed! Thank you so much once again. This will be my go to ham glaze from now on. Please keep sharing your recipes. Awesome! I’m so glad your family enjoyed it and thanks so much for coming back to let me know how it turned out. Has anyone made it substituting corn starch for the flour to make it gluten-free? Hi Beth, thanks for stopping by. While I have not tried using corn starch before, I do think it would work. I do think you would have to heat it up on the stove before applying to the ham to get it to thicken properly, though. Let me know how it goes if you try it! Thanks so much for your comment. I’m so glad you like it! This is sure not boarish dry ham. Thanks for sharing this recipe. It sounds wonderful. . . trying today. About what temperature did you cook it at and for how long? That depends on the type of ham you are cooking. I always use the package directions. For example, most spiral hams that are cooked are around 15 – 20 mins per pound at 325 F. Hope you like it! this ham looks so delicious, do I have to use cloves? Do you actually wrap the ham in foil; or just put it over the top of the ham? This looks so good.I want to try this.I always used the orange juice and brown sugar glaze but this sounds better. Brown sugar and meat is just magical! Thanks, Dee, it is quite tasty! I can’t wait to make it again this fall. That just made me hungry again! I love ham. A brown glaze sounds amazing!